Sebastian Merkner went only reluctantly to his office. The self-employed carpenter completed Saturdays always his bills because he could then work undisturbed by the daily business. After a few hours in the room he was nervous and felt like charging. Then there were the headaches and eyestrain. The relationship between the office environment and the discomfort was obvious. Merkner went through the possibilities in his head: Was the beams of the wooden ceiling painted with wood preservatives? Escaped from the formaldehyde glued bookshelf? Was the mastic asphalt under the floor covering of the culprit? The master craftsman brooded for months after the causes of his symptoms. Meanwhile, the building biologist Robert Wettklo had arrived at the office. The aim was to determine the appropriate sampling strategy for measurement of pollutants. Suddenly the craftsmen an allergy occurred on the outer palm. Even his wife had it not been noticed. Now one gave the other. Merkner liked leaning on hand at the desk. The same he did at the sales counter in the entrance area. Both pieces of furniture had been painted six years ago with the same wood preservation glaze. Apparently a contradiction: for toys suitable and yet poisonous? The entrepreneur couple could not believe it. The wood preservation glaze was advertised in the sales documents as non-toxic. The glaze should be even suitable for children’s toys. And now the product is suspected of causing an allergy. Robert Wettklo looks at the safety data sheet. 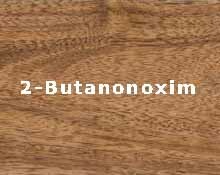 The wood preservation glaze contains, inter alia, 2-butanone oxime. The chemical is wood preservative glazes added in low concentrations and should prevent the annoying skin formation on the surface. The measure facilitates the processing for the painter. 2-butanone oxime is known to cause allergic reactions in professional circles. In REACH procedure is a more stringent risk identification was recommended. In animal studies, toxic liver changes were detectable after chronic exposure in rats and mice. The allergenic potential of 2-butanone oxime seems to be confirmed in the specific case of the craftsman Sebastian Merkner. First action: remove the source of pollution. Without hesitation, Sebastian Merkner will remove the desk in the office and replaced by untreated wood. After eight weeks, then the balance is drawn. Is the carpenter now symptom-free? Will the allergy regress at hand? This exciting project is not finished yet. This entry was posted in indoor airpollution and tagged 2-butanone oxime, allergens on 2015/11/26 by joachim-w.